The app isn't working as expected. Is there a mistrake in the way of how I'm passing a struct via stack? In AMD64 mode there is no 16 bit push. Why not just: mov rdi,1+2 shl 16 + 3 shl 32? 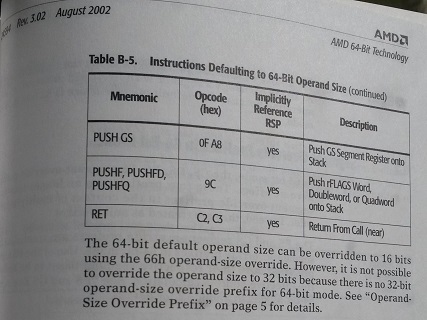 The original AMD64 architecture had 16-bit PUSH in long mode (as a side effect of the prefix-opcode symmetries) and it was a documented behavior*. Later, when Intel adopted the same architecture, it removed these atypical encoding variants (I don't blame them). You can still get fasm to generate the 16-bit variants in long mode with the PUSHW mnemonic. That said, I would not recommend even trying this route. Probably only the earliest CPUs implementing x86-64 architecture really supported this. * I just opened the original x86-64 manuals to look for this just to make sure that I have no false memory of it. I'm attaching the excerpt I found - the PUSH instruction is listed earlier in the table, but the note below the table is what I wanted to show. This may be one of the first time I opened these paper manuals in ages, the last time I was really reading them was back in 2004 when working on x86-64 support for fasm.